PlayStation announced today that spring fever is back on PSN and kicking out the deals for PS3 owners. What the deal with Spring Fever you ask… It’s where you get games at up to half price on the PSN for the the months of April, May and June. On March 25th PlayStation is giving us an early taste of what’s to come for the next few weeks TWO deals – and heavy hitters at that – featuring the PSN exclusive Gravity Crash and Everyday Shooter for the low low price of $4.99 each (regular price: $9.99). Or maybe your Avatar is looking a little plain lounging around your virtual apartment – how about a new outfit? PlayStation Home is in on the Spring Fever action with two special costumes, available only to Spring Fever Sale shoppers. 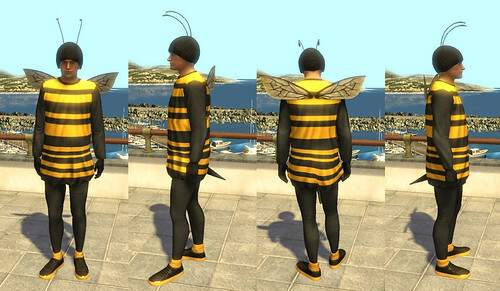 Grad a “Spring Bumblebee” costume or select maybe your more of a “Spring Flower” kind of person. But here is the catch… Users will be rewarded with a voucher to be redeemed for a portion of the five part-costumes with the purchase of an item from the Spring Fever Sale. * Images thanks to PlayStation blog.